This compact, three bedroom country charmer doesn't scrimp on details with its open, contemporary interior punctuated by elegant columns. Dormers above the covered porch light the foyer, which leads to a dramatic great room with cathedral ceiling and fireplace. The great room opens to an island kitchen with breakfast area and accesses a spacious rear deck. Tray ceilings add interest to the dining room, bedroom/study, and master bedroom. The luxurious master suite features a walk-in closet and bath with double bowl vanity, separate shower, and whirlpool tub. 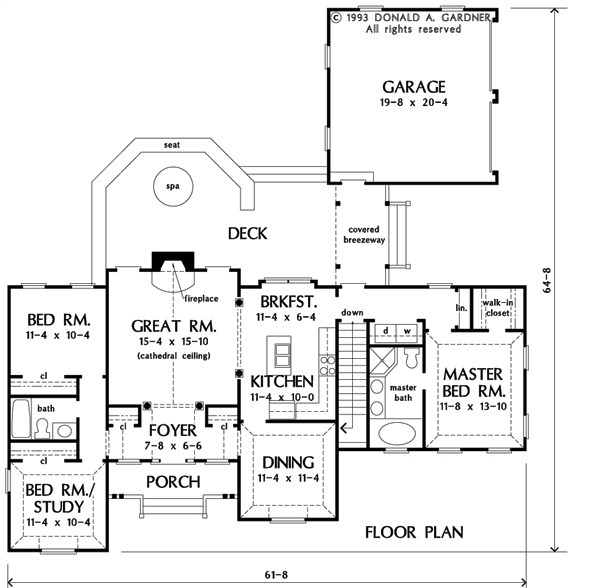 1st Floor: 1452 Sq. 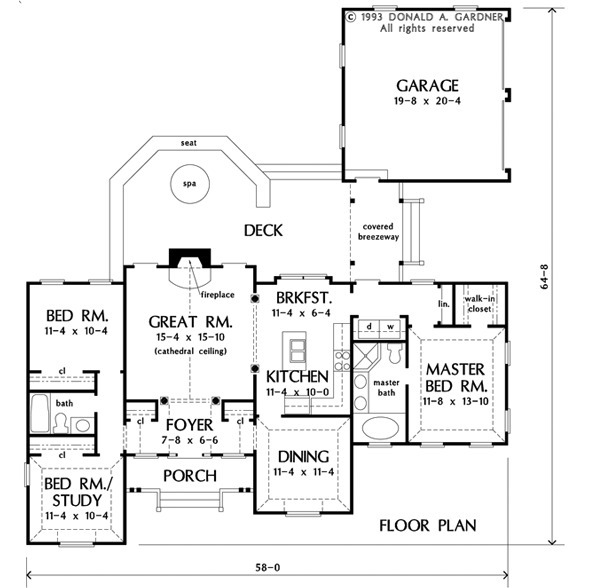 Ft.
House Dimensions: 58' 0" x 35' 8"
Great Room: 15' 4" x 15' 10"
Master Bedroom: 11' 8" x 13' 10"
Utility Room : 6' 4" x 2' 8" x 8' 0"
Garage : 19' 8" x 20' 4" x 0' 0"
Master Bedroom (Tray): 11' 8" x 13' 10" x 9' 7"
Bedroom / Study (Tray): 11' 4" x 10' 4" x 9' 7"
Bedroom #2 : 11' 4" x 10' 4" x 8' 0"
Porch - Front : 15' 4" x 5' 10" x 0' 0"
Deck / Patio : 28' 0" x 15' 6" x 0' 0"
Other : 7' 4" x 12' 0" x 0' 0"
Foyer (Vaulted): 7' 8" x 6' 6" x 16' 8"
Dining Room (Tray): 11' 4" x 11' 4" x 9' 7"
Great Room (Cathedral): 15' 4" x 15' 10" x 16' 2"
Breakfast Room : 11' 4" x 6' 4" x 8' 0"